2018 Alta Redshift SM. Picture credits - Alta. Submit more pictures. The Redshift SM is the ultimate urban commuter. Built with the DNA of a race supermoto, our Redshift SM eliminates the incessant oil changes and maintenance intervals of its competitors. It�s street-legal, and a potent motorcycle on crowded city streets. Commute, race, and run errands on the Redshift SM. Price as new (MSRP): US$ 13495. Prices depend on country, taxes, accessories, etc. Wheels: Warp 9 Elite 17� Front / 17� Rear. Pirelli Rosso II tyres. Comments: 6 hours charging. Range 50 Miles. US made bike. Ask questions Join the 18 Alta Redshift SM discussion group or the general Alta discussion group. Get a list of related motorbikes before you buy this Alta. Inspect technical data. Look at photos. Read the riders' comments at the bike's discussion group. And check out the moped's reliability, repair costs, etc. 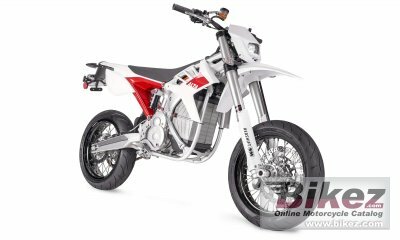 Show any 2018 Alta Redshift SM for sale on our Bikez.biz Motorcycle Classifieds. You can also sign up for e-mail notification when such mopeds are advertised in the future. And advertise your old MC for sale. Our efficient ads are free. You are also welcome to read and submit motorcycle reviews.